Kerry Patel will discuss how historical European floral styles have influenced today’s floral designs, as it relates to wedding floral design as well as every day centerpiece arrangements. Flowers have always been appreciated for their opulence, their fragrance, and their tales of romance. Today, flowers are more than just decoration; flowers help set a mood, create a feeling, and add a personal significance to any event. Kerry will share how she finds inspiration to create one-of-a- kind floral designs with meaning, the influences that have shaped her style, and the elements that go into an impactful design. Kerry will demonstrate a sophisticated focal centerpiece and a romantic bouquet for the modern bride. Kerry is the owner of Kerry Patel Designs, a fine art floral design and styling studio, designing romantic, evocative florals and tablescape for small, intimate weddings and events. Her designs evoke emotion through their lush blooms and textured elements taking one on a visual and sensorial journey with each design. 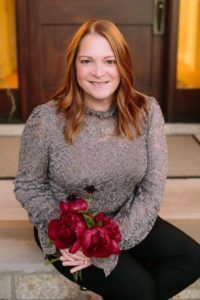 After leaving a corporate job to start a family and raise her son, Kerry rediscovered her passion for flowers and decided to pursue floral design. Kerry set oﬀ for “flower school”, learning from and studying under renowned innovative floral designers she admires and those who continue to influence floral industry trends. When a good friend on the west coast asked Kerry to design her wedding flowers, and then another locally, she knew that designing florals for weddings – near or far – would be her focus. In addition to weddings and parties, Kerry has designed for bridal fashion shows and editorial photo shoots. Her wedding work has been published to both national and international wedding blogs. Locally, her work has been featured at Anthropology Short Hills, the Museum of Early Trades and Crafts, Frelinghuysen Arboretum, and as the centerpiece of countless dining room tables in the area. At each General Meeting during the year, members in attendance have had the opportunity to fill out a ticket to win one of two floral arrangements created by Kerry Patel during her April program. At the conclusion of her program, there will be a drawing for the sophisticated focal centerpiece and the romantic bridal bouquet for the modern bride. Good luck to all! 0 Comments on "TMC General Meeting – Kerry Patel"